StockMarketEye is an award-winning portfolio tracking solution that helps businesses address their basic portfolio tracking needs. It is a standalone service that is installed on your computing device and is designed for local information storage. 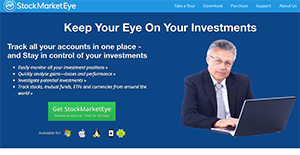 StockMarketEye is a very straightforward and simple portfolio tracking software that also functions as a stock watcher. Basically, you can use it to keep a closer eye on the market, and more specifically, on your investments. This means you can easily monitor the performance of your retirement accounts as well as your other investsments. StockMarketEye also helps you gain insights in the market and derive insights from dynamic stock charts including technical indicators. StockMarketEye lets you start off easily and quickly, beginning with the painless import of your investment data straight from supported brokerages. Data from standard investment files (QIF, OFX/QFX or CSV), or even data entered by hand using simple data entry tools can also be imported. With StockMarketEye, you manage and follow as many investment portfolios as you like, including actual investment accounts. You can also set up virtual portfolios to follow big name investors or even your own fantasy portfolios. Powerful reports give you the data you need to accurately analyze your investments. From the raw transactions list, to performance reports, to the unique Back-in-Time report, StockMarketEye gives you multiple ways to view past and present activity. Portfolios can be grouped together, allowing you to get an aggregate view of their combined totals and holdings. You can even run reports on the group, as well as see what your largest holdings in the group are. Creating and managing groups is as simple as drag-and-drop. Within your portfolios, you can create categories of holdings to better track and analyze your holdings. Categories can be created for whatever purpose you choose and you can get totals for all the holdings within a category. Setup is easy: just create a category and drag-and-drop holdings into it. StockMarketEye has powerful multi-currency support. Each portfolio can include holdings in multiple currencies. StockMarketEye automatically converts holdings in a foreign currency into your portfolio’s base currency. Gains/Losses are calculated to include exchange rate differences. You can also view your portfolio in charts: both market value and performance charts are available, making it even easier to view and analyze historical performance. StockMarketEye lets you keep unlimited watchlists of stocks, ETFs, mutual funds, currency pairs, and option symbols. You can keep your picks organized and separate them into topical watch lists. Ticker symbols from most major world exchanges are supported, so you can track stocks from around the world to see where the best action is. You can even group watchlists, just like with portfolios, for better organization. Within a watchlist, you can create categories of stocks to better organize the picks. The built-in stock charts make it easy to visually analyze stock performance. Simply click on a stock in your watchlist or portfolio to view its historical price chart. Add comparison symbols to the chart so you can quickly compare your selection to the comparison symbol. You can use a broad range of indicators to analyze the technical position of your stock’s chart. With more than 16 technical indicators supported, most chartists will find what they are looking for. The external chart window is a separate window that can be used to focus on the charts and you can quickly flip through the symbols in your watchlists and portfolios. StockMarketEye allows you to set alerts on activity in your holdings and watchlists. You can set price and volume alerts, to be notified when a stock passes a certain level. Alerts that are set and triggered visually stand out within the application. With its Growl integration, you can even get alerts on your desktop or have them forwarded to your mobile phone. StockMarketEye has full-featured versions for Windows, Mac OS X, and Linux. A single purchased license allows you to run any or all of these versions on any of your personal computers. Simplified versions are also available for iOS and Android phones and tablets. The software’s online (i.e. cloud) synchronization service allows you to keep the same portfolios and watchlists on your desktop and phone/tablet. What Problems Will StockMarketEye Solve? When you have multiple accounts at different brokerages, it is tedious and time consuming to total your holdings and actively manage your investment positions across all the accounts. StockMarketEye helps you get a better handle on all of those accounts in one place. By seeing all of your holdings together in one place, viewing totals and analyzing performance, you’ll get a better picture of your global net worth and where you can make changes to your allocation across all of your accounts. If you take care of the investments of multiple family members, it can be difficult to manage them all across different brokerages and accounts. StockMarketEye facilitates this by letting you manage as many portfolios as you need, and it also brings them together into different groups. You can keep all of the investment information in one place, but separate them into different groups so the values stay separate. As a swing trader, you want to keep your eye on as many stocks as possible, so you can put yourself in the right place at the right time to make a profitable trade. StockMarketEye makes this easy as you can track an unlimited number of stocks, and organize them into watchlists and groups of watchlists. If you use the built-in alert system, you can make it even easier to stay on top of important price movements. It's essential to note that hardly any software in the Accounting Software category will be an ideal solution able to meet all the needs of various company types, sizes and industries. It may be a good idea to read a few StockMarketEye reviews first as certain services may excel just in a very small set of applications or be prepared with a very specific industry in mind. Others can function with a goal of being easy and intuitive and as a result lack complex elements desired by more experienced users. You can also come across apps that support a broad group of users and provide a complex feature toolbox, but this in most cases comes at a higher cost of such a solution. Ensure you're aware of your needs so that you pick a service that has exactly the functionalities you look for. How Much Does StockMarketEye Cost? We realize that when you make a decision to buy Accounting Software it’s important not only to see how experts evaluate it in their reviews, but also to find out if the real people and companies that buy it are actually satisfied with the product. That’s why we’ve created our behavior-based Customer Satisfaction Algorithm™ that gathers customer reviews, comments and StockMarketEye reviews across a wide range of social media sites. The data is then presented in an easy to digest form showing how many people had positive and negative experience with StockMarketEye. With that information at hand you should be equipped to make an informed buying decision that you won’t regret. What are StockMarketEye pricing details? What integrations are available for StockMarketEye?